Chilli (then know by rescuer as Kili) lived with about 30 dogs and 10 cats in a yard. It is thought he lived there for about a year. The owner filled the place with animals that she could not care for and would regularly beat them, often with sticks and metal poles. She would leave scraps for the cats but never fed the dogs, they scavenged for food. It was a small town, news got out about the animals and rescuer Slavica visited and tried to feed them and help. Chilli used every opportunity to escape through the gate when she came and went, but did not know what to do, he would stand in the street and then returned to the yard knowing nothing else. He was the thinnest and most tortured there. Slavica recalled to me "I could hear him screaming whenever I left him. When I finally had him he was so scared, so thin, he just fell to the ground time and time again expecting to be beaten". Eventually Slavica convinced the owner to let her take him. 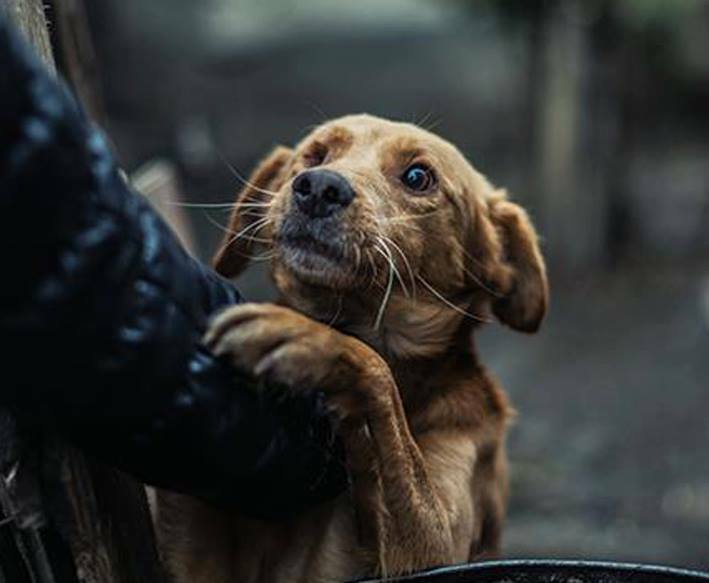 With the help of Blind Dog Rescue UK he was brought to the UK. In the hands of fosterer he underwent an operation to investigate the eye injury which had just sealed up, his eye was found to be pushed back right into the socket and badly damaged, the result of many beatings, usually with sticks. His skull is damaged and he carries many scars and even to this day doesn't like to be touched in some places. In foster with Sian Porter he gradually came out of his shell from a very timid and troubled dog to a more confident lad, but still with many hang-ups. After three months in foster we were sent his picture by a friend, I just knew he was the one for us and we set about adopting him. We adopted him in July 2013, the 'smiling picture' was taken after the first full day with us. He soon bonded with our two labradors and still has a very special bond with Shona. 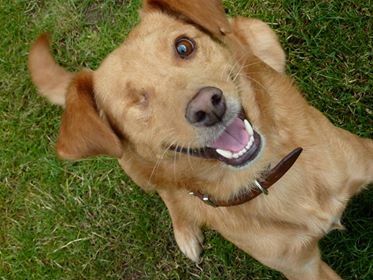 Sadly we lost Harvey but then gained another BDRUK dog in Ace, another 'one eyed wonder'.